Folding Outdoor Laptop Chair | OhGizmo! While workaholics aren’t exactly OhGizmo’s primary demographic (reading blogs is more time that could be spent working remember) I know there are plenty of you out there who wouldn’t mind taking a vacation but can’t seem to tear yourself away from that PC. Well as long as you have a laptop at your disposal now you can enjoy that sandy beach or peaceful campsite while still staying productive. There are plenty of collapsible chairs on the market but this is the first I’ve seen that is actually engineered to allow you to comfortably work on a laptop while ‘relaxing,’ Besides easily folding down for storage and transport this chair has a patented Backtracker support system that can be adjusted almost like an office chair can helping you find the most comfortable seating position. It also includes a laptop tray that can slip over the mesh arms giving you a sturdy place to work as well as side pockets for holding books, paperwork or your computer when not in use. On top of all that the chair also includes an ottoman footrest so you can literally put your feet up and relax. 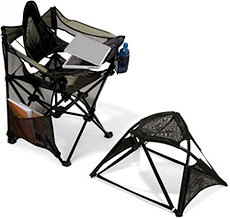 The Portable Outdoor Laptop Chair is available from Hammacher Schlemmer for $39.95. I just heard about something called a laptop sunhood that you can attach to the laptop which will eliminate the glare so you can work outside. They are a little funny looking, but if they really work I’d say go for it!